How does that saying go? Valentine’s Day was made for chocolate? Well, maybe it’s not a saying, but we think they’re words to live by. 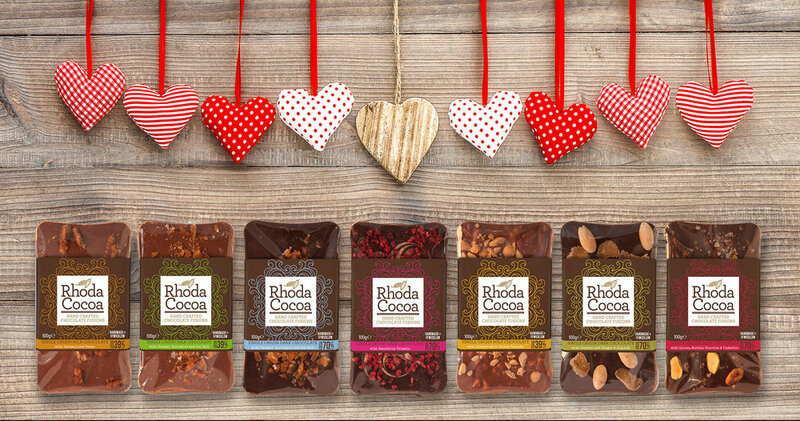 That’s why we’re delighted to be running a Valentine’s Day competition which gives you the chance to win a set of 8 Rhoda Cocoa chocolate bars. The set features one of each bar in our range and includes our newest addition, our dark chocolate bar with strawberries and sweet orange oil. Because strawberries and chocolate are essential Valentine’s ingredients, right? To enter the competition, all you have to do is sign-up to our newsletter and answer a simple question, this ensures you’ll be the first to receive word of our new chocolate bar releases and future competitions. You must be living in Ireland to enter the competition (sorry, international fans, we hope to do something for you soon). You deserve a Valentine’s treat, so have your name in the competition by midnight Tuesday, 13th February, 2018. We’ll be in touch with the lucky winner at midday on Valentine’s Day. So, what are you waiting for? We’d love to be part of your Valentine’s Day moment of delight. Please check your email for a confirmation. You will need to confirm your subscription to our newsletter to be entered in the competition.